OTG™ Upholstered Stack Chair  Free Shipping! These fabric upholstered stack chairs from Offices To Go are an ideal space saving seating solution for any guest, reception, conference or waiting room. 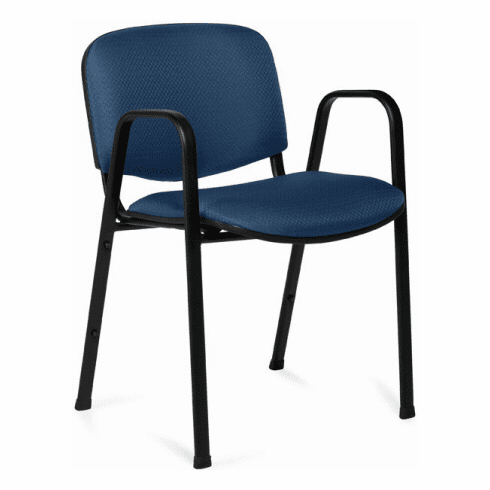 Features include durable stain resistant fabric upholstery available in your choice of (4) different colors, foam padded seat and backrest cushions, frame integrated loop arms, black epoxy powder coated frame finish, and four post legs with protective plastic end caps. Optional transport/storage dolly available. Stackable up to 8 chairs high on optional dolly. Available with no arms for space or style preference. This chair meets or exceeds ANSI/BIFMA standards. Dimensions: Seat Size: 18.5"W x 17.5"D. Back Size: 18"W x 12.5"H. Seat Height: 18.5"H. Overall: 30.5"H x 21.5"W x 23"D. Five year limited warranty from Offices to Go.